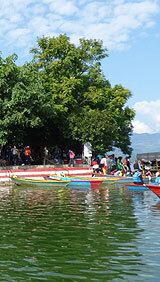 When visiting Pokhara, the short boat ride out to the Barahi Temple is well worth it. All boats going to the island are hand rowed; you can take the larger craft and share the trip with locals or hire out a smaller boat plus oarsman for a relatively low price. Although quite a tourist attraction it's surprising how quiet it is when you arrive. 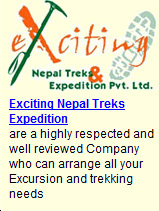 The main percentage of people are Nepalese who go there specifically for prayer and blessing purposes. There's several little corners where you can sit and admire the splendid view of the lake and on a clear day, the Annapurna Range to the north. There are some small Stalls on the Island but rest assured you're not cornered by anyone. It's a really pleasant place to be.